Can Inversion Therapy Relieve Back and Neck Pain? Suffering from back or neck pain can hugely impact on your quality of life. The activities that you once enjoyed may not be as enjoyable anymore. But, if you’ve tried and exhausted all the remedies for your pain and found no success, try looking to inversion therapy for an alternative solution. Inversion therapy is a spinal traction technique that involves being suspended in an inverted position. This position helps to reduce gravitational pressure on the nerve roots and spinal discs. Our bodies – including our spinal cords – are constantly affected by gravity. This invisible force puts pressure on our joints, bones, muscles and ligaments. The combination of gravity and muscle imbalances can force your vertebrae together, pressing on your spinal discs as a result. Around 80% of adults experience lower back pain at some point during their lives. This can range from a dull ache to a sudden sharp sensation. Most cases of upper and lower back pain are caused by spinal compression. Pressure on your spinal discs is often uneven, and the discs aren’t designed to handle uneven pressure, causing them to bulge or herniate. Inversion therapy is a great way to help decompress and stretch your spine, relieving pressure and increasing the space between your spinal discs. What Conditions Does Inversion Therapy Treat? Stops shrinkage – Regularly inverting yourself can help maintain your height and help you avoid the shrinkage that naturally occurs as a result of gravity over a lifetime. Improves blood flow – When inverted, your blood circulation is aided by gravity. Stress relief – Inversion therapy provides the same feeling of relaxation as a yoga class. Most people find that they can sleep better with regular inversion therapy. Heightens mental awareness – Inverted activity increases the supply of oxygen to the brain, which is believed to help maintain mental sharpness. It can also increase flexibility as inversion therapy helps your joints stay healthy and supple. Improves posture – The stretching motion that is aided by the reversing force of gravity on your body helps you to sit, stand and move with more ease. Realigns your spine – Running and other aerobic activities can compress your spine – often unevenly. Activities such as golf and tennis often pull the spine out of alignment. With inversion therapy, minor misalignments can often correct themselves naturally. Start reaping the benefits today by ordering your InvertMate Inversion Therapy Table. 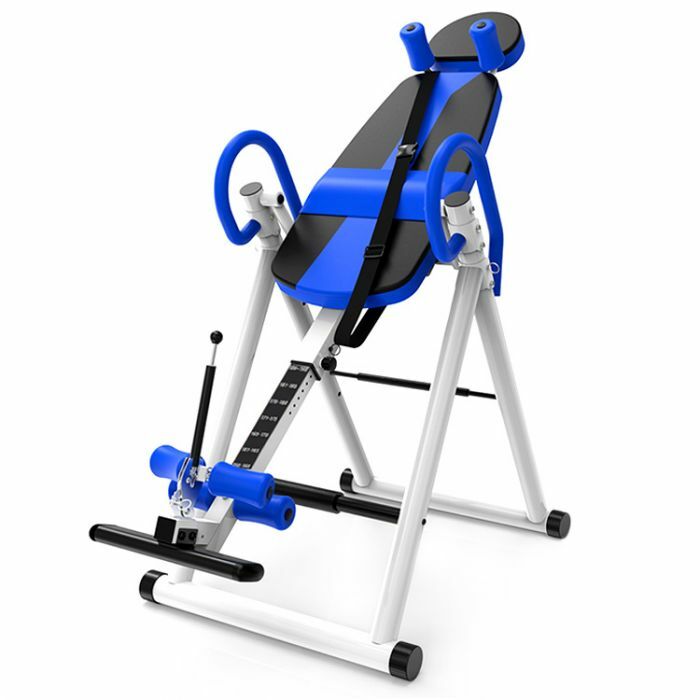 The inversion table is able to invert you up to 180°, whilst maintaining your safety through the shoulder brace, safety belt, and lower safety bars.